Posted by Dave Emory ⋅ April 1, 2017Post a comment Email This Post Print This Post Tweet This! 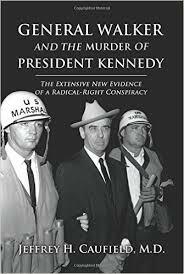 In several upcoming Food For Thought posts, we will be excerpting a recent, massive volume General Walker and the Murder of President Kennedy by Jeffrey H. Caufield M.D. NB: For a seasoned researcher, this is a useful and important book, however it MUST be handicapped–the author is dismissive of the [by now recorded fact] that elements of the intelligence community were involved in the killing. Of course, they were. Please clarify and further develop your comment. It is not at all evident what you are trying to say.